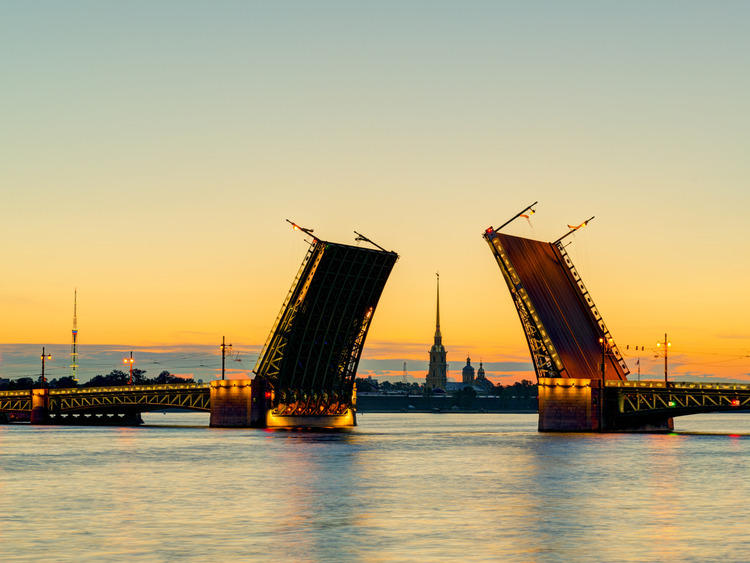 An unforgettable night-time tour of St. Petersburg across its countless drawbridges that are opened every night from May to October. The magic of the "Venice of the North" and the "white nights" awaits! We will set off at night to explore magnificent St. Petersburg lying on the banks of the river Neva and the countless small islands in its delta. As we cross the city we will be able to admire the spectacular web of 300 bridges, 20 of which are drawbridges crossing the river, and take some photos from the most picturesque spots of the façades of the main monuments lit up at night. St. Petersburg's bridges are open every night after 1:00 am from May to October and allow large ships to pass. It is an incredible sight that attracts lots of tourists. From the end of May to the beginning of June, nights in St. Petersburg are particularly clear, earning them the name the "white nights". The phenomenon relates to the city's unique geographic position, situated on the 60th parallel north. During this period, the sun goes down below the horizon for no more than 9°, leaving behind its mysterious twilight. Whilst the coach drives us along the intriguing streets of the naval shipyard, the city's rich architecture and history will appear before our eyes. We will cross Birzhevoy Bridge and after a quick stop for photos we will catch our first glimpse of Vasilievsky Island and its two rostral columns which were once lighthouses that guided ships through the crowded port of St. Petersburg. From there we will have a majestic view of the widest part of the river Neva. Our tour will then take us to the strategically positioned Peter and Paul Fortress built in 1703 following Domenico Trezzini's design commissioned by Peter the Great. At the centre of the fort, we will admire the Peter and Paul Cathedral. It was built between 1713 and 1732 and is still the highest point in St. Petersburg, overlooking the entire city. The coach will drive us past the Artillery Museum, which showcases Russia's military history, and then onto *Trinity Bridge with its six metal arches. We will then stop at another of St. Petersburg's famous bridges, known as Pevchesky Bridge (or Yellow Bridge, the work of George Adamdove in 1840), where we can take some photos. Our tour will continue with a trip to Palace Square, the city's main square and focal point thanks to the architectural arrangement with the Alexander Column in the centre. In the northern part of the square lies the picturesque, Baroque Winter Palace. It was once the imperial residence and is now home to the Hermitage Museum. Our night-time tour will then take us to the Rococo Smolny Cathedral, designed by Bartolomeo Rastrelli and built between 1748 and 1764, also known as the cathedral of the resurrection. Our next stop will be St. Isaac's Square, where the Cathedral of the same name takes centre stage. It was built between 1818 and 1858 in a Neo-Classical style and boasts a golden dome 21.8 metres tall, making it the fourth tallest cathedral in the world. Then we will cross Blagoveshchensky Bridge or Annunciation Bridge, which is 331 metres long and was opened in 1850, before we travel along the street where the universities are located. When we reach the Academy of Art, we will admire the two sphinxes standing 3.5 m tall. They were found in the excavation of Thebes (1820-32) and bought by a Russian diplomat in Alexandria by order of Nicolas I. The two sculptures are testament to over 3,500 years of history, from the era of Egyptian Pharaoh Amenemhat III to the Russian revolution and the Second World War. Our tour will end with another stop to take photos of yet another stunning view of Vasilievsky Island and the bridges that cross the banks of the river Neva. We inform our Guests that the departure time of this excursion will be approximately at 11:00 pm and the return on board at 02.00 am.